It wasn't long after Katelyn Tuohy posted the sixth fastest indoor girls mile time in history on Wednesday that she laid doubt on whether she would give the distance another run for its money this season. The North Rockland (NY) High School junior cruised at the New York Road Runners Millrose Games qualifier to a US No. 1 time of 4:39.15 -- 20 seconds for her last 100m -- at The Armory in New York City, mostly hitting her goal-pace of 35 seconds per lap. She bested second-place Sarah Trainor by 15 seconds. Following her race, Tuohy then told her local news outlet, The Journal News, that she had doubts on whether she would participate in the Millrose Games mile on February 9 because it would come just two weeks following her first hard effort of the year in a professional 3K at the Dr. Sander Invitational--also at The Armory. Tuohy's likely goal is to break the national record of 9:00.16, which Alexa Efraimson accomplished in 2014. She currently owns the No. 3 fastest time in high school history (9:05.26). A year ago, Tuohy finished fourth at the Millrose Games elite high school girls race, fading in the final lap after leading for much of the event. She later set the national record at the distance outdoors at New Balance Nationals Outdoor in 4:33.87. "I'm not sure I'm going to run it," Tuohy told The Journal News. "After the 3K, if I'm still tired, there would be no point of running Millrose." If nothing else, it's showing a measured approach from the North Rockland junior, who ran nine cross country races this fall and is transitioning to a season in which the body can sometimes have a difficult time adjusting to the sharp turns of an indoor track. Last winter Tuohy ran 13 indoor races in total, including efforts at 600m, 1K, 1500m, 1-Mile, 3K and 5K. Already this season she's dropped out of an 600m at the Ocean Breeze Freedom Games and has opted out of the DMR at The VA Showcase on Feb. 20, the facility in Lynchburg is where she set a national record in the indoor 5K last season. Her team's decision not to race in Virginia was more of a logistical concern, however. The decisions behind Tuohy's racing plan are likely rooted in her long-term health and sharpness. 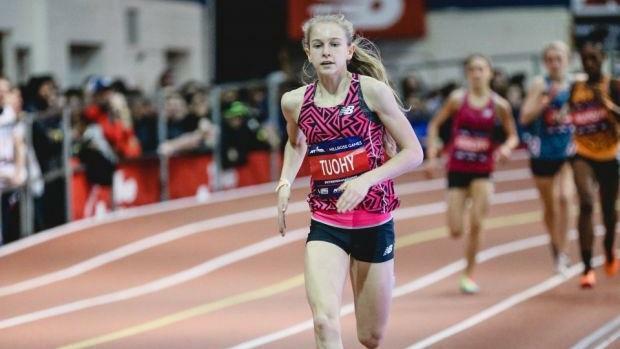 In the last two seasons, Tuohy's only big loss came at the Millrose Games -- she was second in a 600m in her local county championships last February.